WASHINGTON, DC, May 23, 2012 (ENS) – America’s most endangered river is the Potomac, which flows through the capital of the United States, says the nonprofit organization American Rivers in its 2012 annual report. The Potomac was placed at the top of American Rivers’ annual list to alert the nation to the fact that Congress is considering cuts to national clean water protections, just as rivers nationwide are facing threats from natural gas drilling, pollution and new dams. The urgency of this alert is highlighted by the fact that it is taking place during the Clean Water Act’s 40th anniversary year. “This year’s Most Endangered Rivers list underscores how important clean water is to our drinking water, health, and economy,” said Bob Irvin, president of American Rivers. 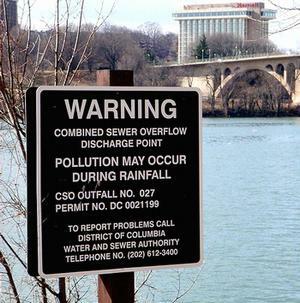 Before the Clean Water Act was enacted in 1972, the Potomac was “a cesspool of sewage and industrial pollution,” American Rivers points out. Now, due to the Clean Water Act, the Potomac is cleaner and safer for drinking, boating, and fishing. But the Potomac is still suffering, says American Rivers, citing a University of Maryland report card has given the river a “D” grade for water quality for the past two years. The Potomac River runs 405 miles from the Fairfax Stone in West Virginia on the Allegheny Plateau to Point Lookout, Maryland, and drains 14,679 square miles before flowing into the Chesapeake Bay. “The Clean Water Act is the reason the Potomac River is no longer called a “national disgrace,” said Ed Merrifield, president of the nonprofit Potomac Riverkeeper. American Rivers and the other clean water advocacy groups are calling on Congress to kill any legislation that weakens the Clean Water Act or prevents the Environmental Protection Agency and the U.S. Army Corps of Engineers from restoring protections for small streams and wetlands under the Act. 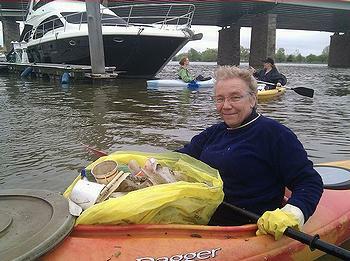 Today American Rivers announced the kickoff of its National River Cleanup. For more than 20 years this program has mobilized hundreds of thousands of volunteers to pick up trash from plastic bags to old tires to large appliances from rivers and streams. #1: Potomac River (Maryland, Virginia, Pennsylvania, West Virginia, District of Columbia) Threat: Pollution At risk: Clean water and public health The Potomac provides drinking water to more than five million people and offers recreation opportunities. But the Potomac is threatened by agricultural and urban pollution that could get worse if Congress rolls back national clean water protections. “If Congress puts polluters before people, our nation’s river – and many other rivers nationwide – will become a threat to public health, unsafe for drinking water, wildlife, or recreation,” warns American Rivers. #2: Green River (Wyoming, Utah, Colorado) Threat: Water withdrawals At risk: Recreation opportunities and fish and wildlife habitat The Green River is the largest tributary of the Colorado River. Thousands of anglers fish and thousands of rafters marvel at the river’s majestic canyons each year, generating jobs and supporting the economies of three states. However, a proposal to pump a massive volume of water out of the Green into a 500-mile pipeline across Wyoming to Colorado’s Front Range threatens world-class recreation, rural economies, critical fish habitats and the water supply for the lower Colorado River Basin. American Rivers is calling on Governor Gary Herbert of Utah and Governor John Hickenlooper of Colorado to join Wyoming Governor Matt Mead in opposing the pipeline and selecting more efficient, cost-effective water supply solutions. #3: Chattahoochee River (Georgia) Threat: New dams and reservoirs At risk: Clean water and healthy fisheries The Chattahoochee River provides drinking water for millions in metro Atlanta, is one of America’s best trout streams, and was recently designated as our country’s first National Water Trail. Yet a water war between Georgia, Alabama, and Florida has spurred proposals for costly new dams and reservoirs that would harm water quality, destroy recreation opportunities, and ruin wildlife habitat. American Rivers is asking the Army Corps of Engineers to deny permits for these reservoirs and calling on state decision makers to embrace water efficiency instead. #4: Missouri River (Iowa, Kansas, Minnesota, Missouri, Montana, Nebraska, North Dakota, South Dakota, Wyoming) Threat: Outdated flood management At risk: Public safety The Missouri is the nation’s longest river, supplying drinking water, commerce, and recreation, and impacting the safety and well-being of millions. But the river and its communities suffer from outdated flood management, as shown by massive flooding along the Missouri in 2011. American Rivers advocates using floodplains and wetlands to absorb and store flood waters, and is calling on Congress to fully fund the Missouri River Recovery Program and long term planning studies for the river. #6: Grand River (Ohio) Threat: Natural gas development At risk: Clean water and public health A State Wild and Scenic River, the Grand is a haven for rare birds and other wildlife and boasts the best water quality of any stream flowing into Lake Erie. However, natural gas development threatens the river’s clean water and public health. American Rivers is asking the State of Ohio to strengthen safeguards to ensure natural gas development and the disposal of wastewater does not harm the river. #7: South Fork Skykomish River (Washington) Threat: New dam At risk: Habitat and recreation The Skykomish is one of Washington’s most popular rivers for fishing, paddling, and scenic beauty. But a proposed hydropower dam would destroy the wild character of the river’s South Fork, and reduce two spectacular waterfalls to a trickle. American Rivers wants decision makers to abandon this project and focus on better energy alternatives. #8: Crystal River (Colorado) Threat: Dams and water diversions At risk: Fish, wildlife, and recreation The Crystal River provides essential habitat for fish and wildlife, beautiful vistas and recreation for visitors, and is one of the few remaining free-flowing streams in Colorado. But new hydropower dams, reservoirs, and water diversions threaten to destroy the river’s unique values. American Rivers is asking local water districts to reject the dam proposals in favor of more efficient and cost-effective water supply solutions and support federal Wild and Scenic River designation for the Crystal River. #9: Coal River (West Virginia) Threat: Mountaintop removal coal mining At risk: Clean water and public health The Coal River supplies drinking water for local communities, supports fish and wildlife, and has a water trail for fishing, boating, and other recreation. However, the river is threatened by mountaintop removal coal mining, which has already buried, poisoned, and destroyed miles of streams in the basin. “Congress must restore Clean Water Act protections to the Coal’s headwater streams in order to prevent more destructive mining and permanently safeguard clean water and public health,” American Rivers says. #10: Kansas River (Kansas) Threat: Sand and gravel dredging At risk: Public health and wildlife habitat The Kansas River provides drinking water for 600,000 people and is the state’s most popular river for canoeing, kayaking, and other recreation. But sand and gravel dredging, which would cause severe harm to clean water, wildlife, and recreation opportunities, threatens the river. American Rivers is asking the U.S. Army Corps of Engineers to complete a comprehensive study of the impacts of dredging, deny all new permit requests, and plan to end dredging on the Kansas River by 2017. Now in its 27th year, the annual America’s Most Endangered Rivers report is a list of rivers at a crossroads. Over the years, the report has helped spur many successes including the removal of outdated dams, the protection of rivers with Wild and Scenic designations, and the prevention of harmful development and pollution.